If you've ever seen the popular web series 'An African City' then you're no stranger to ‘Ngozi,’ a character so sweet you can gain 5 lbs. just looking at her. She's that girlfriend that hasn't been jaded who’s there to remind us of how we used to be. And while people have come to know and love Ngozi, they're only beginning to discover Esosa E., the New York City born actress, author and holistic lifestyle advocate who so convincingly plays her. Get to know Esosa and you'll discover that she's passionate about health and beauty and has authored two books, 'The Acne-Free Diet' and 'Parasites Be Gone' to help others on their journey to a more holistic life. Her third book, 'Got Veg? How to Thrive on a Plant-Based Diet’ came about as a way to answer the many questions she received from readers of her blog about the basics of a vegan lifestyle. So if you've ever wondered what it would take to become a vegan, but had serious questions, wonder no more. Like a true girlfriend, Esosa's got everything you need to know. Read on! Esosa: A vegetarian is someone who refrains from eating meat but may include eggs or dairy products like milk and cheese in their diet. Vegans choose to abstain from all forms of animal products including meat and dairy. 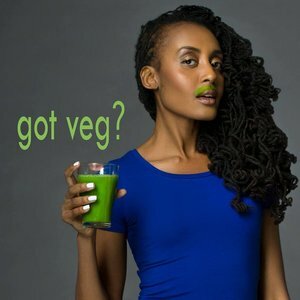 I am African vegan, and eat primarily raw foods (uncooked) when I'm in my ideal living environment. I went vegan when I was around thirteen years old and didn't really have a major source of inspiration when I started. Many years later I had horrible skin and borderline chronic fatigue. I was motivated to go raw to heal my acne, and it worked. Within one month on raw foods my skin was acne and scar-free and glowing. Which do you ultimately recommend? Esosa: I believe in bio-individuality, which in essence takes into account that we all have different blood types, genes, and other factors that can affect what is the best fuel for our bodies. I'm also a huge fan and ongoing student of Ayurveda which can help people find their ideal diet based on their overall energy type which they call doshas. I do not believe the vegan diet is the best diet for everyone, but I have personally witnessed the healing effects of plant-based living and it has been documented through research that plant-based diets can have drastic and incredible effects when healing many diseases. What are the benefits of a vegan lifestyle? Esosa: Some of the benefits I have experienced include clear skin, increased energy, youthfulness, and creativity. Because of my lifestyle I rarely get sick and also have deepened my spiritual practice. If you adopt a whole foods, plant-based lifestyle and are eating a balanced diet you immediately decrease the chances of contracting diabetes, high blood pressure, obesity, heart disease and more. What was your family's reaction to you becoming vegan? 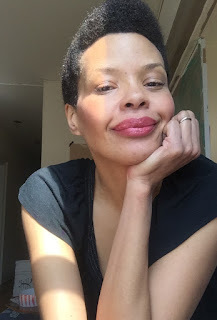 Esosa: My family thought I was a little crazy at first, but over time as they witnessed my own personal transformation it affected their choices. After a few years of teasing I came home and there was almond milk and tofu in the fridge. Now everyone calls me for health advice. Does being vegan stunt your social life? Esosa: Being vegan will only interrupt your social life if you let it. Learning how to cope socially as a plant-eater was one of my major challenges when I transitioned. I overcame the social issues by preparing dishes to share with family and inviting friends to join me at my favorite vegan spots. Rather than get stressed about it I decided to bring people into my world and that helped a lot. In fact, people more often than not were inspired by my choices and enjoyed trying something new. If you are vegan and going to dinner, always speak up and let people know. If the friends you are visiting are clueless about preparing plant-based meals, take some food to share with you and have a great time. Is it harder to date as a vegan? Do you end up dating only vegan men? Esosa: I don't believe in love being hindered by food preference. But if a man was to consistently ridicule my dietary choices, it would never work out. What are the biggest misconceptions about going vegan? Esosa: People think that being vegan means that you have to sacrifice eating delicious food. That is really not true; its all about knowing how to prepare plant-based foods. My book ‘Got Veg?’ has over fifty recipes to try immediately upon reading. The other major misconception is that vegans do not get enough protein and cannot build muscle. There are many incredible plant-based foods that are rich in protein, and also many vegan athletes that have proved you can not only build muscle but become a champion while consuming a plant-based diet. What is your advice to people who are interested in a vegan lifestyle? Esosa: Try it! You have nothing to lose and everything to gain, especially if you are dealing with an ailment or are interested in clearing your skin, losing ​weight, or just increasing your vitality and youthfulness. 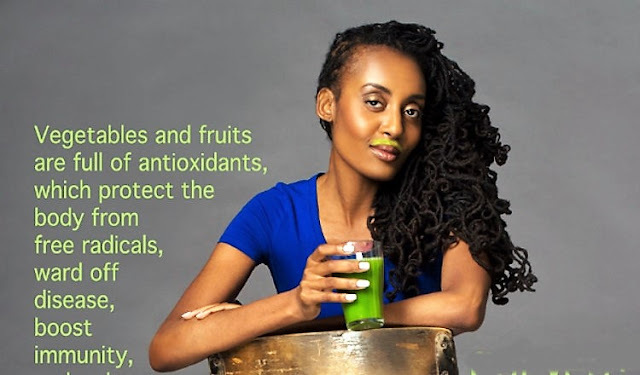 For more Esosa E., visit her website & health Blog! Are you about that vegan life?